Restorative Dentistry | Lindner Dental Associates, P.C. Do you want to know what to do about a missing tooth? Do you ask “Why do I need my fillings replaced?” Here are some ways we could make you have a happy healthy smile. A crown, often called a cap, is an artificial cover that restores a decayed or damaged tooth to its normal shape and size. A fixed bridge can replace one or more missing teeth. 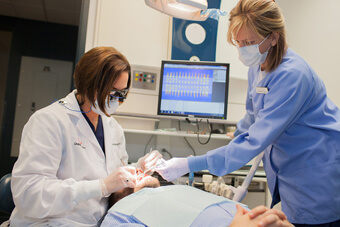 It consists of one or more replacement teeth attached to crowns that are placed on 2 or more surrounding support teeth. Your dentist may recommend a partial denture if you don’t have strong enough support teeth on either side of your missing teeth to support a fixed bridge. A partial denture helps to preserve the life of your remaining teeth. A dental implant is much like a natural tooth, which has a root in your jawbone, topped by a crown that you can see. When you need an implant, your dentist inserts a metal post beneath your gum and into the bone. It fuses to the bone of your jaw and acts like the root of a tooth. Then your dentist makes a replacement crown on the metal post, designed to blend in with the way your own teeth look and feel. Dental implants also can be used to anchor dentures.